Louis Saha gave a masterclass in clinical finishing either side of Blackpool clinically punishing two mistakes made by Everton players. However, it was a double defensive substitution by Ian Holloway that failed to snuff out Everton’s attacks that swung the game back in David Moyes’ favour. The opening play saw Holloway pitting his 4-3-3 against the 4-1-4-1 of David Moyes, who had Marouane Fellaini in the holding role in a system that had stifled Blackpool earlier in the season at Bloomfield Road. James Beattie started in the front three, alongside Jason Puncheon and DJ Campbell who dropped deep from the centre to receive the ball. Moyes has watched Blackpool a lot this season and knows he needs to block the space with a holding midfielder and lined up 4-1-4-1 against Holloway's 4-3-3. In effect there appeared to be three key dynamics that lead to Everton’s win which are discussed below. Prior to this game starting Blackpool had conceded 16 goals in their last 5 games since beating Liverpool. 13 of them have germinated in the right back area as teams appear to have spotted and exploited a real weakness in the Blackpool defence. This season Everton have been exceptional down their left hand side, so this match had the potent combination of Blackpool’s weakness matching up with Everton’s strength and this was key in this game with all 5 of Everton’s goals coming via this channel. Taking Everton’s first goal step by step you can see how their defence is drawn out of shape by some simple Everton passing and movement. Neil Eardley shows Bilyaletdinov plenty of space to turn and run. 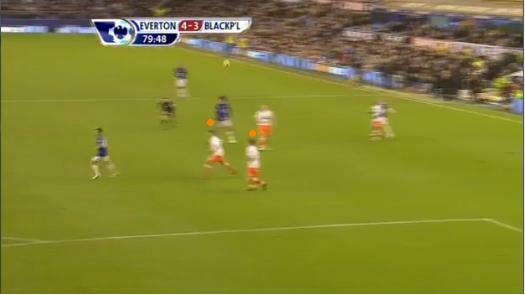 David Vaughan has to track the Everton runner who has exploited the space that Eardley leaves behind him. Eardley does recover his ground, but commits to the challenge and is beaten easily by Bilyaletdinov and the Blackpool defence has conceded 20 yards of space for him to attack. 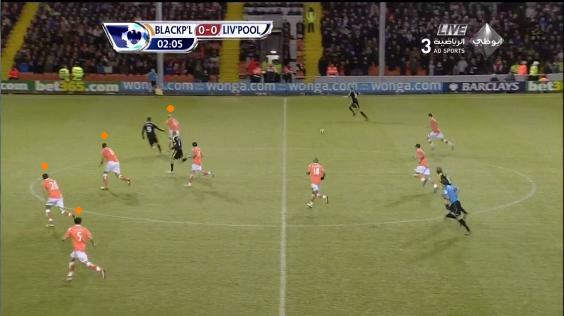 Blackpool's centre backs are unable to doing anything to stop the cut back cross ball. Everton focused their passing down their left hand side and completed 60% of their passes in open play down the left hand side. 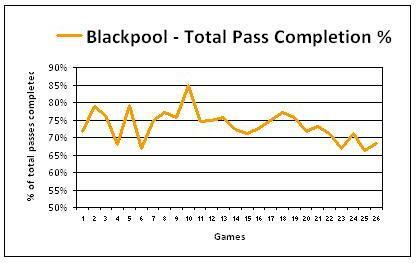 This blog recently discussed the importance of Blackpool’s full backs in their open sense of adventure, however, it appears that teams understand this to be as much of a weakness too. 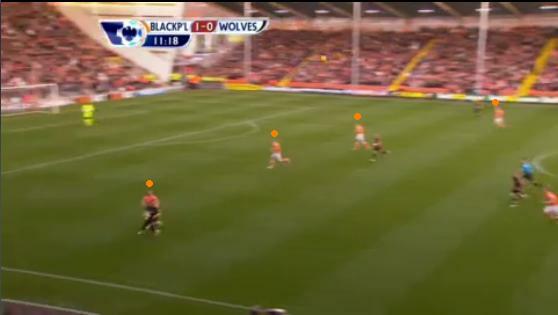 As the full backs attack they leave space behind and recently it appears the space isn’t being covered effectively. Should Blackpool stay in the Premier League then Holloway will have worked hard with his full backs to sustain their attacking potency whilst ensuring defensive stability. Without doubt Everton controlled the space on the pitch very effectively for the most part, however, after going 2-1 up the appeared to push for a third to kill the game off. In doing so they started to lose a little of their shape and Blackpool exploited this very well in transition and capitalised on mistakes. 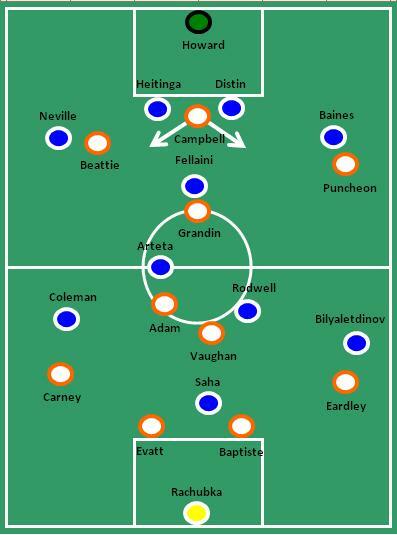 As a result of Marouane Fellaini sitting in a 4-1-4-1 Blackpool were strangled and even on the rare occasion when Elliot Grandin was able to get goal side of Fellaini, he ended up not being able to find a team-mate. 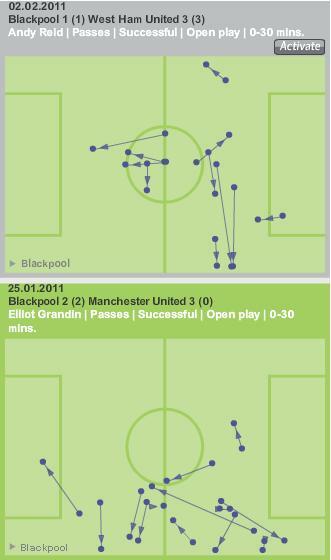 Here you can see that Grandin has escaped Fellaini in a very rare first half occurrence, but fails to make it pay. 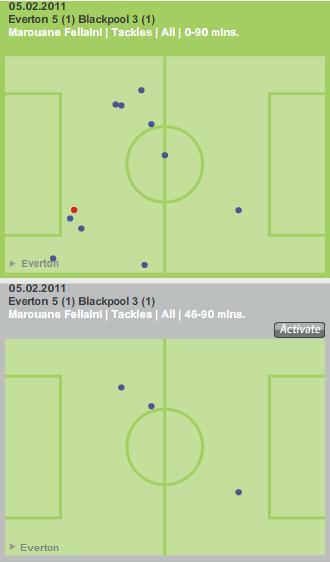 Fellaini closed out Charlie Adam effectively in the first half, even when he was in the deep. Look at the shot below as Fellaini makes up several yards to close Adam down which forces Adam in to an error and leads to Everton’s build up for their first goal. Fellaini is aware of Adam dropping deep, sensing danger he steps out of position to close Adam down in the space marked by the red dot. Fellaini has closed out Adam and he hits a wayward pass handing possession to Everton who go on to score. 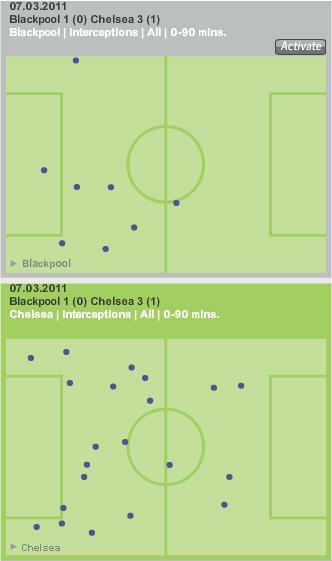 In fact Charlie Adam was stifled in the first half and had a pass completion of only 48%. As he was gradually afforded more space in the second half it increased to 67%. As further demonstration of how Everton disrupted Blackpool’s passing their completion was 64% in the first half and in the second it was 68%. 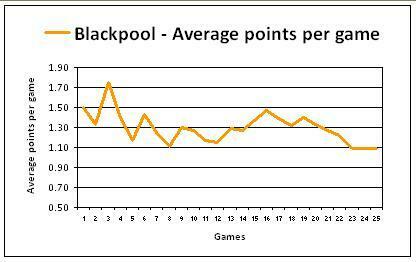 It is interesting to note that for Blackpool’s period of goal scoring (between 61 and 65) it increased to 78%. 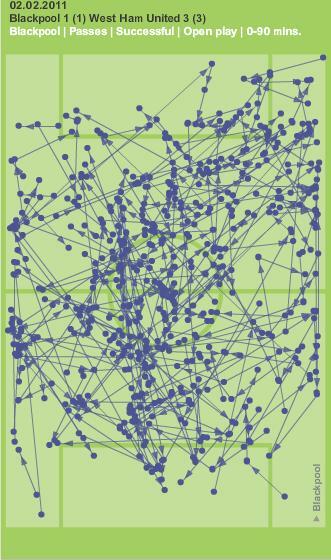 The Chalkboard below shows how Fellaini contested 11 duels and won 10 in the whole match, however, 8 of those were in the first half and he and won 7 of those as he dominated the midfield. 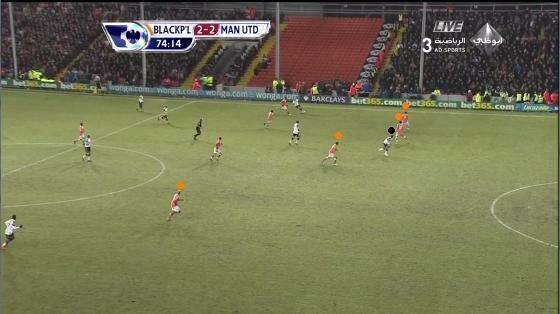 As Fellaini stopped being dominant in his duels Blackpool enjoyed their success. Was this just a coincidence? Fellaini had a great game in the tackle, however, in the second half as the game swung towards Blackpool he failed to win duels. As he started to win them again on the 73 minute mark Everton started to control again. 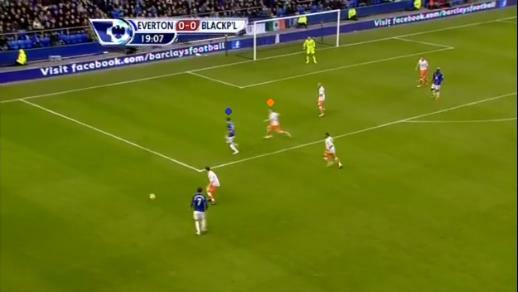 At 3-2 Blackpool appeared to have Everton exposed to the counter and it was at this point Holloway tried to change the dynamic, seemingly to shut the game out. In his post match interview he likened his move to the one made against Liverpool to shut out the result. However, the two moves were completely different, against Liverpool his switch came with 5 minutes remaining, whilst he had a full 20 minutes to control here. 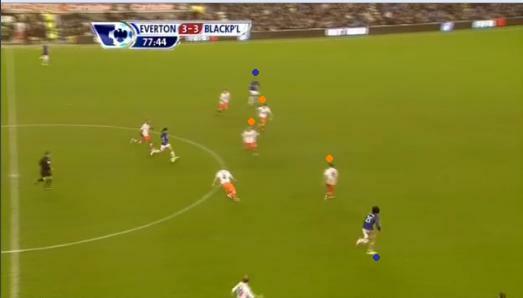 Also, he went to a 4-1-4-1 against Liverpool whilst against Everton he went to a very unfamiliar looking 5-4-1. In doing so, he conceded his small advantage in favour of asking Everton to try to break them down. 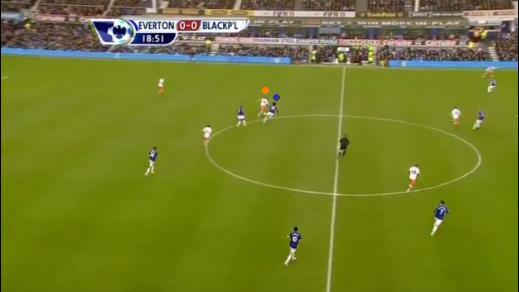 Everton did, through a combination of defensive mistakes, dis-organisation and naivety. 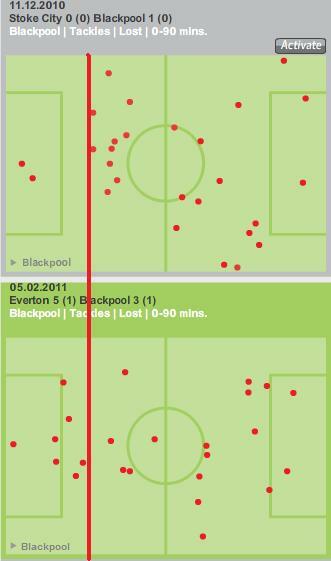 The shots below show how Blackpool struggled to organise themselves in to a coherent 5 man defence. Firstly, the centre backs are drawn narrow and inside the Everton attackers and secondly in the run up to the Everton fourth goal, as the third centre back (Rob Edwards) is out of position with Neil Eardley behind him. 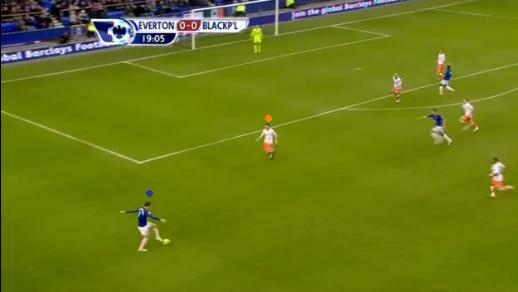 Blackpool struggle to space their 3 centre backs allowing themselves to be drawn inside the Everton attackers leaving plenty of space either side of the three. 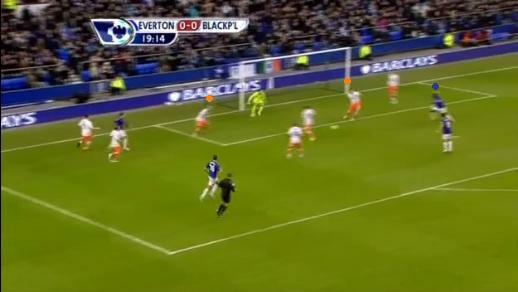 From another angle Blackpool's defence is totally out of shape as Beckford puts Everton ahead. As further evidence of how the defensive move didn’t pay off, see the chalkboard below and notice how Blackpool fail to win any duels as Everton pick off three unanswered goals. 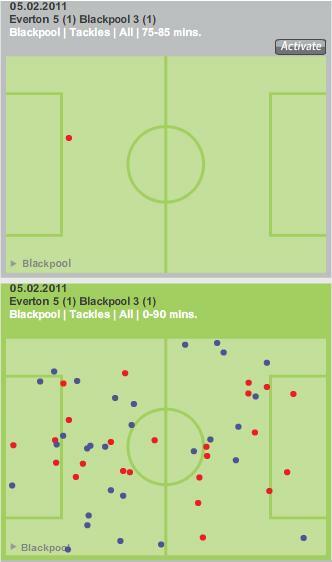 Above, even when Blackpool went defensive, it never paid off, losing 1 tackles in a 10 minute period. Prior and before that they worked hard in the tackle even though they lost 24 of their 53 challenges. This was a battle launched firmly on a robust Everton side shutting out Blackpool’s attacking space, before stinging them down their flawed right hand area. However, after handing Blackpool space on the counter Ian Holloway will move on to the next game knowing that his team are still potent, and will hope to find a better way of controlling the game against Aston Villa should he find his team holding the advantage. West Ham outworked Blackpool in the central area of the pitch to record a deserved victory as Ian Holloway shuffled his team selection which ultimately appeared to disrupt the fluency that they have found at many stages this season. 4-3-3 v 4-4-2, West Ham’s Obinna being the player who drifted the most from either side. This was a clear 4-3-3 v 4-4-2 battle and for the first time this season Blackpool were undone by a flat and very plain 4-4-2 with few defining features. There was two clear reasons for this. 1. Mark Noble and Scott Parker worked hard to deny Blackpool’s midfield enough space to operate and when they won the ball they were economical with it. 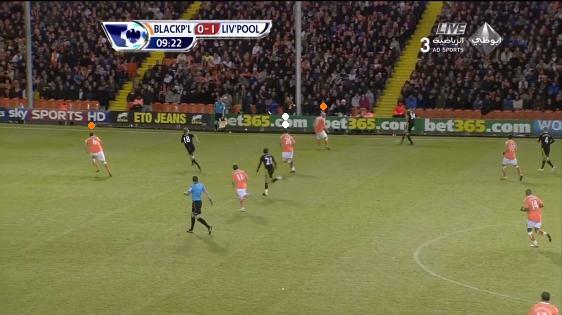 The consequence of this was that Blackpool’s pass completion dropped to 71%. 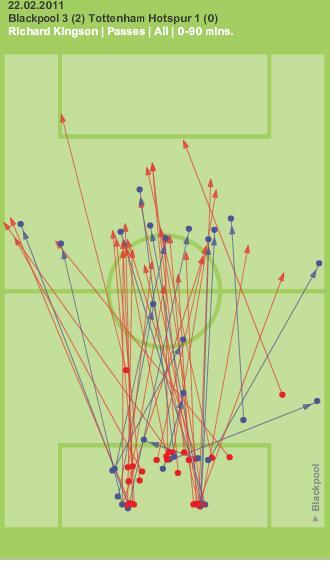 Between Noble and Parker they attempted 100 passes completing 77% compared to Vaughan and Adam who attempted 123 passes completing 69% of them. 2. When David Vaughan and Charlie Adam found space; Andy Reid was struggling early on to understand his role in a new team and was often too static. This appeared to be backed up as Ian Holloway appeared to have a lengthy discussion with him around the 20 minute mark. After about half an hour he was swapped with Gary Taylor-Fletcher. Assuming Reid was told to play a central winger role as defined by Zonal Marking the other month, then by looking at the chalkboard below you can see how Reid stayed in central area more opposed to the way that Grandin drifted to the flanks in the previous game against Man Utd. Added to this Reid misplaced 8 of his 19 passes in open play. Assuming both Reid and Grandin are assigned the same role then you can see the difference from the opening 30 mins of the last two games. Reid appears to stick in middle as Grandin drifts to the wing. 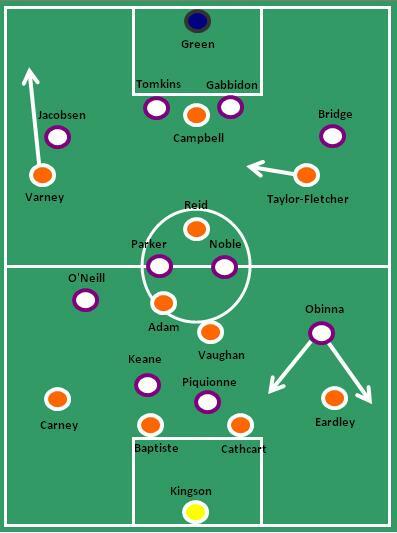 A final point on Blackpool’s formation, as is becoming normal when chasing a game, Blackpool moved more in to a 4-2-4 as Holloway made his usual aggressive substitutions. Ian Holloway made his first call of the night by picking a defensive line that had never played together before. 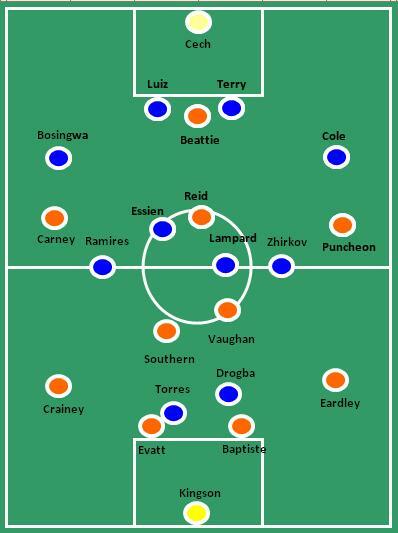 David Carney came back from the Asian Cup Final (where he went for a jog instead of marking Tadanari Lee, who scored the winning goal) and in to the left back spot with Alex Baptiste moving in to centre back as Ian Evatt was dropped to the bench. The back line didn’t settle and Holloway brought on Evatt on at the break to replace Craig Cathcart. 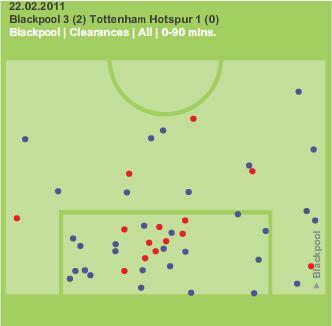 The impact of these changes saw Carney sit back more than Stephen Crainey would have done, whilst West Ham (as previous clubs have done) appeared to target an apparent weakness in Blackpool’s right back area. In previous games both Sunderland and Manchester United have opened up Blackpool down their right side, this isn’t to say that it’s the right back who is causing the issue as the right-sided centre back has a duty of cover as well. It appears that there is a lack of cohesion at times down that flank and West Ham were the latest side to benefit. What causes this appears to be three things. Firstly, the right back (Eardley in this case) misses tackles. Secondly the right back loses position and doesn’t recover quick enough. Finally, the centre back not anticipating danger and being able to cover adequately enough. With Carney not having the sense of adventure that Crainey brings to the team it appeared to reduce Blackpool’s attacking dynamic down the left and Blackpool enjoyed more success from the right flank. 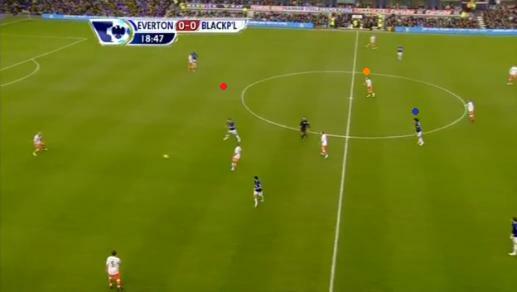 You can see from the Chalkboard below where Blackpool lacked some balance in their passing. Blackpool struggled all game to get in to good positions in the final third. 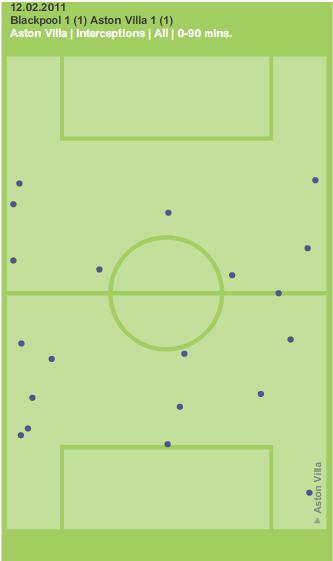 Here you can see how few passes were completed in the final third on the left flank. Possibly Carney lacked the adventure that Crainey brings?? Mistakes were all too common for Blackpool in this match, but West Ham showed up like a team who are used to working hard to battle against relegation and duly got their reward along with a mercurial performance from Victor Obinna. Ian Holloway will have a think about his strategy for integrating his new players in to his side and work hard towards an invigorated Blackpool performance to push Everton all the way this Saturday. Steve Bruce lost Darren Bent to Aston Villa this week and Daniel Welbeck to injury, but arguably it helped to define his team selection and he reaped the benefits. Ian Holloway will be happy with the way the game ended, but will be hoping that injuries picked up don’t affect his side over the coming games. Sunderland made space hard to come by in the middle of the pitch, Malbranque sitting narrow and out of possession Richardson dropped back in to midfield. 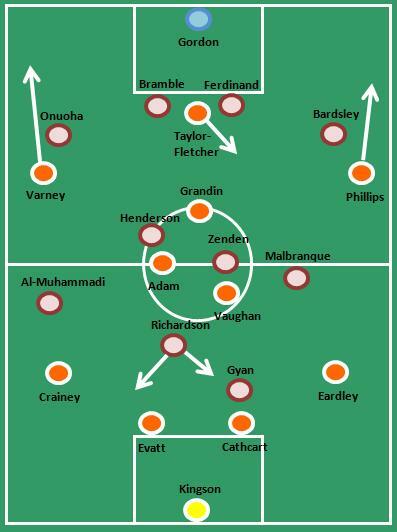 From a formation point of view Blackpool set out in their normal 4-3-3, but Sunderland resembled more of a 4-5-1 out of possession with Kieran Richardson breaking from midfield when in possession of the ball to join Asamoah Gyan up front. Out of possession Sunderland were narrow in midfield, little width was used as Steed Malbranque edged in from the left. 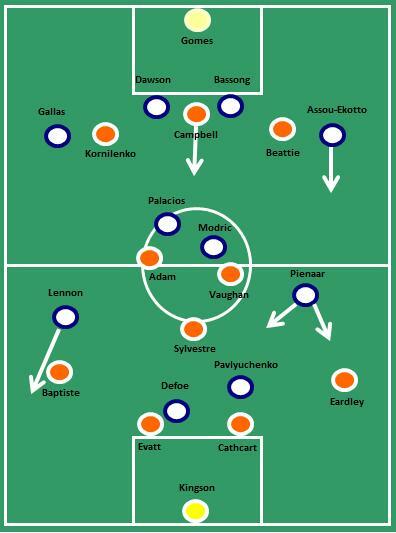 In losing Darren Bent this week Steve Bruce was forced in to setting up this way, arguably had he had the same squad at his disposal as the last time these two sides met then he’d possibly have gone 4-4-2 and potentially given control of the centre to Blackpool. It is often the simplest plans that draw the most success and Sunderland carried out theirs to perfection. Each player worked hard to hassle Blackpool players in possession of the ball and in particular this served two purposes. To break up Blackpool’s passing rhythm in midfield and to stop Blackpool playing out from the back. As can be seen below, Zenden and Henderson were told to press Blackpool when they were in possession of the ball in the deep. 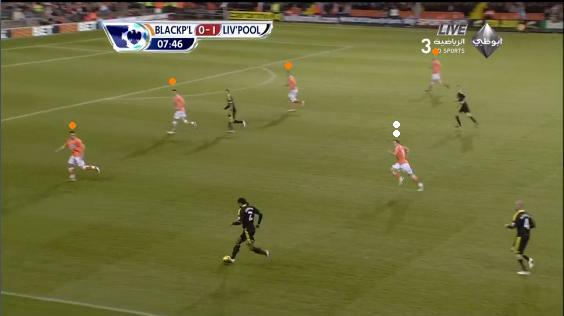 Often this is where Blackpool build their attacks from, not this time, as Adam and other Blackpool players were given little space to work in early on in the game. 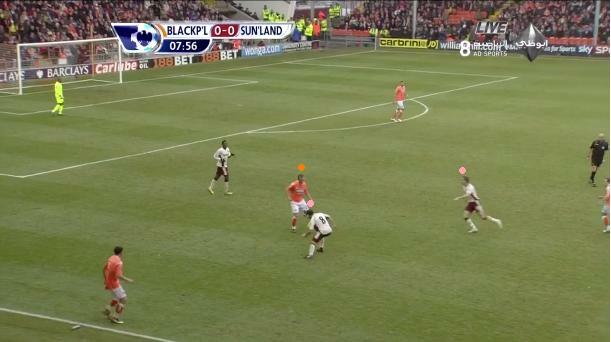 Three Sunderland players ensuring that Blackpool couldn't pass it out from the back. This pressure was applied directly after keeper distribution. Here you can see that Blackpool are suffocated on the edge of their box. Adam has no space to move in to or many passing options. Adam has the ball, but two on rushing Sunderland players are making sure he can't find any space to make a play. The work that Sunderland did in closing down the space pushed Blackpool’s normally reliable passing down to a completion rate of 71%. Sunderland did see less of the ball, but as with any possession in football, it is what you do with it that counts, their pass completion came in at 63%. Sunderland are an athletic and strong team and certainly some strong challenges affected Blackpool and their plans for the day. A boot to the nose of Neil Eardley meant he was off the pitch when they scored and an injury to Richard Kingson meant a substitution had to be used to bring on Paul Rachubka. Added to this Stephen Crainey went of with what appeared to be a twisted knee. 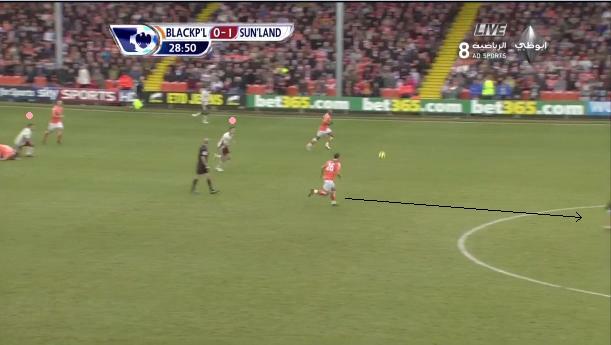 You can see below how Sunderland instinctively attacked the space left by Eardley being off the pitch. If anything Craig Cathcart (20) perhaps should have checked his position as he is very close to Ian Evatt here and has been sucked in to going where the ball is. Arguably, had Eardley been on the pitch then he'd assume the position indicated by the tangerine line and Richardson wouldn't have had anywhere to run in to. This doesn’t detract from the excellent game Sunderland played and in particular Jordan Henderson stood out, assisting in breaking up Blackpool’s midfield winning all 4 of his duels, making two interceptions and spreading the play when he had the ball as well as making intelligent untracked runs in to the wide right position (first half) to deliver some quality crosses. Also Bolo Zenden was excellent in breaking up play in the centre of midfield winning 7 out of 8 of his duels. Blackpool did get to grips with Sunderland at times in the first half and once their realised that Sunderland were over committing men in the press, they then exploited the space. However, Craig Gordon had a superb game and once the game went 2-0 Sunderland were happy to drop deeper and ride out whatever Blackpool could throw at them in the hope of catching Blackpool on the counter. 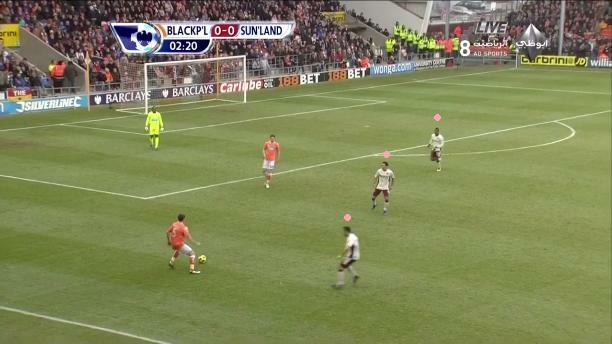 Below you can see what happened when Blackpool chipped the ball over the Sunderland midfield. 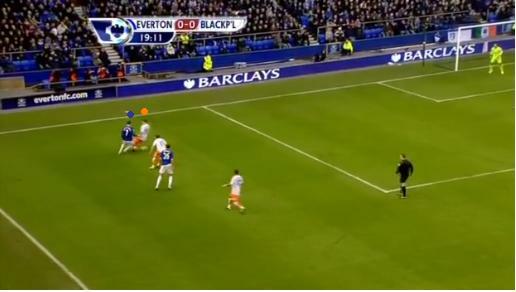 It left Charlie Adam with a full 30 yards to run in to exposing their back line. Only good keeping from Craig Gordon stopped this from being 1-1. All the Sunderland midfield have committed to attack and press in the final third. A simple 'out ball' leaves Adam with a free run to the back line. 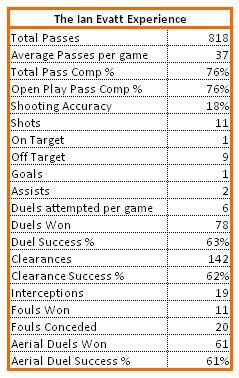 Blackpool lacked the focal point of DJ Campbell, often the player that will drop deeper and work hard to win ball as well as making intelligent runs. Gary Taylor-Fletcher didn’t offer the same movement and mobility upfront as Campbell, he doesn’t make forward runs or peel off the shoulder of defenders, he likes to drop to receive the ball before giving and going. 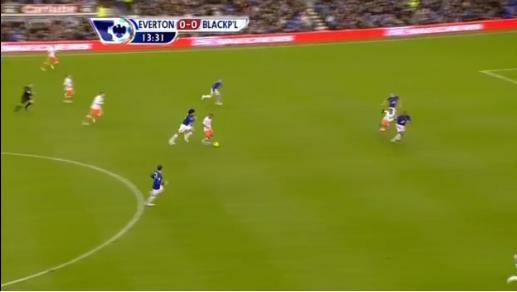 This meant that Charlie Adam had little to aim for by way of runners in to the channels or in behind the defence. Matty Phillips offered some dynamic runs from wider positions, but more often than not he failed to beat his man losing 4 out of 5 take ons. 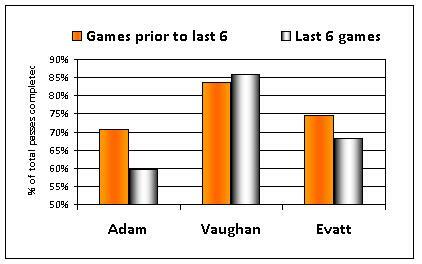 Added to this Luke Varney was very static at times and when he did manage to cut in he failed to make a positive contribution, losing all eight of his duels. In the final third Varney came up short with only 3 of his passes being successful in that area and two of those were out wide and went backwards. 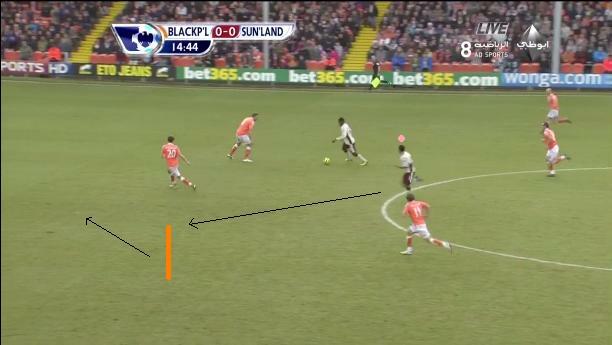 Blackpool found it hard to penetrate the Sunderland defence when running with the ball. 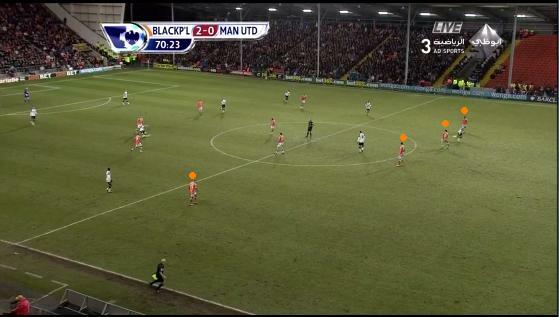 Look at the Chalkboard to show how attacks around the box broke down as Blackpool lost the take on. Virtually the only time they did break the line, they won a penalty. 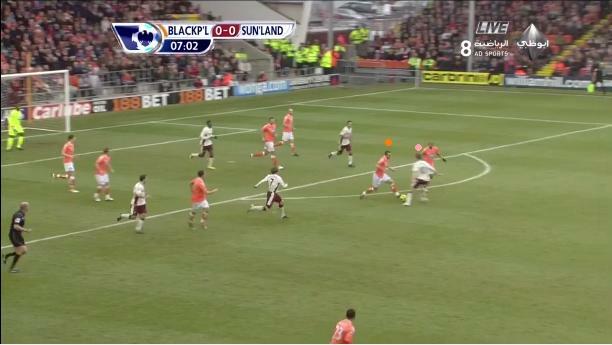 Blackpool trying to take Sunderland players on a losing 17 times, look how many are in the final third. Ian Holloway will hope that his team learn from this display and find their rhythm early against Manchester United on Tuesday night as a strong performance could help to set up this next stretch of games where Blackpool will hope to nudge closer to safety. He’ll also hope that the injuries sustained today, don’t have any major impact on his squad. Steve Bruce will be happy that he won and won via a simple and effective game plan.